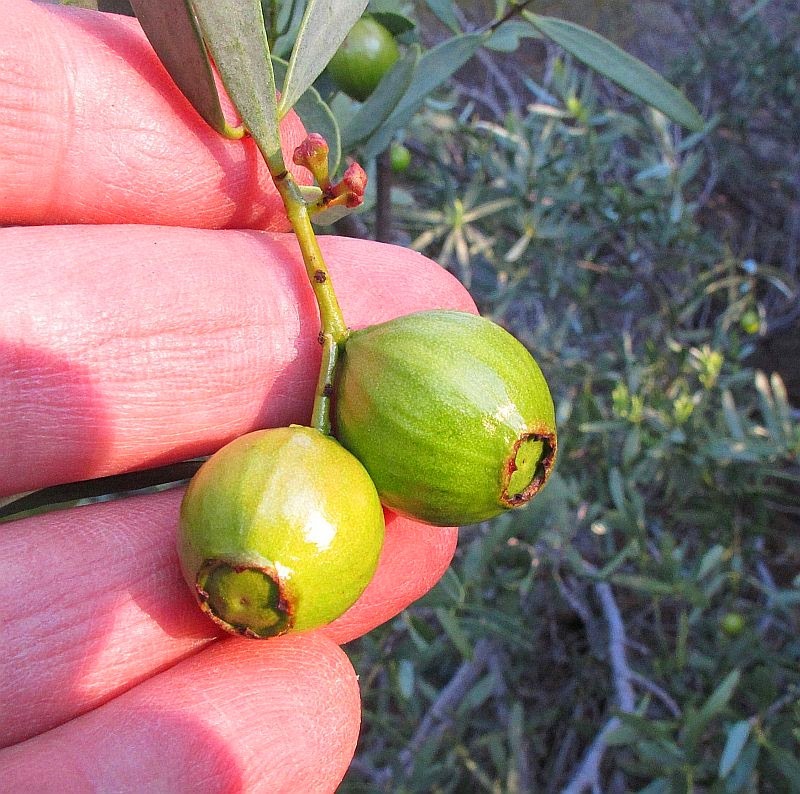 Although common and widespread in WA and SA, it is rare in the Esperance region and due to illegal harvesting for the scented timber, is becoming so in a number of districts throughout its range. It is commercially and legally harvested for export, but is tightly regulated to stop over-exploitation. Herbarium records have it preferring the red sandy soils and or rocky areas, but locally a coarse sandy soil seems to be a good substitute. 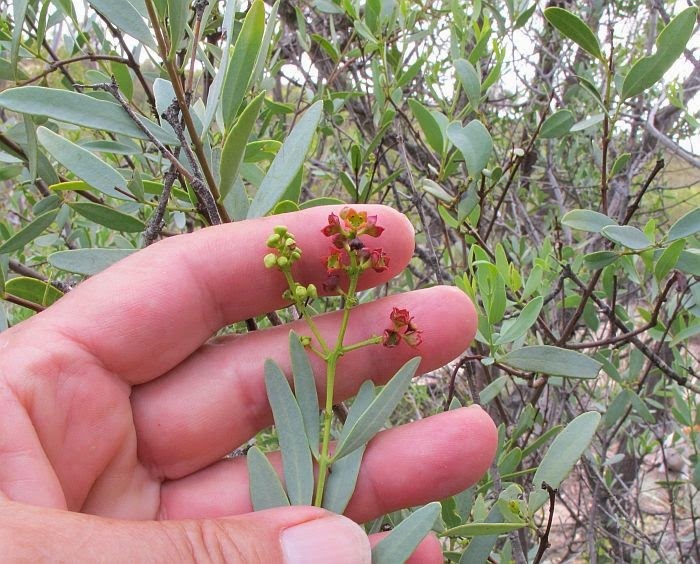 Going on the distribution of Santalum spicatum, it does not occur in the cold/wet conditions of the SW, or in calcareous soils across the Nullarbor, but that still leaves a lot of country to colonise. It is found from the NW coastal area to inland around Newman and onto the Gibson Desert. In SA it occupies the southern half of the State, excluding regions south of Adelaide. 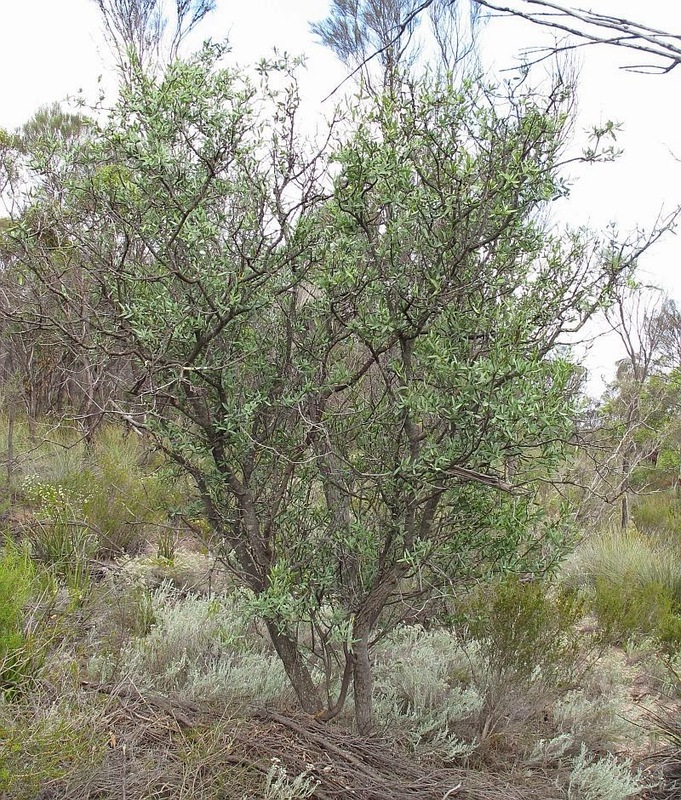 Santalum spicatum can grow as a shrub or to a 5 metre (16’) tree; whilst locally growing as a tree, unfortunately I have not found any seedlings. 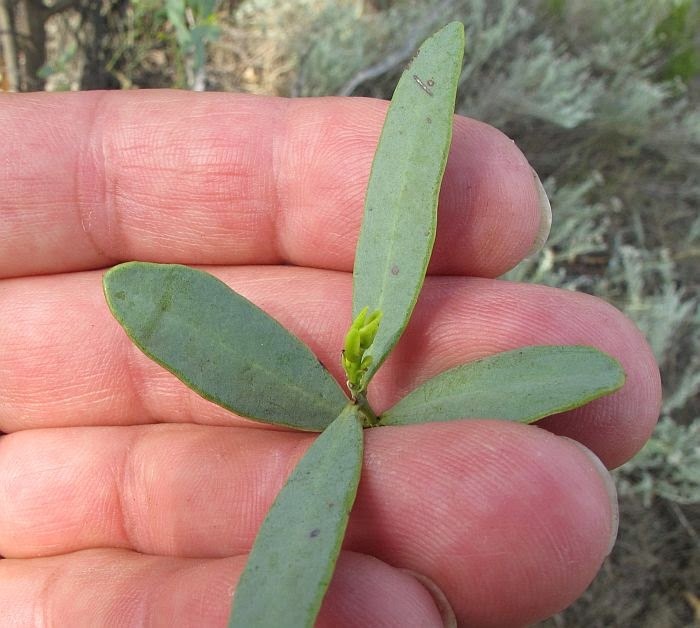 When I first came across the Sandalwood colony (around 20 plants) there were a number of fresh seeds on the ground, but the following year, rodents had eaten every seed under every tree. So colony expansion is not looking overly hopeful. 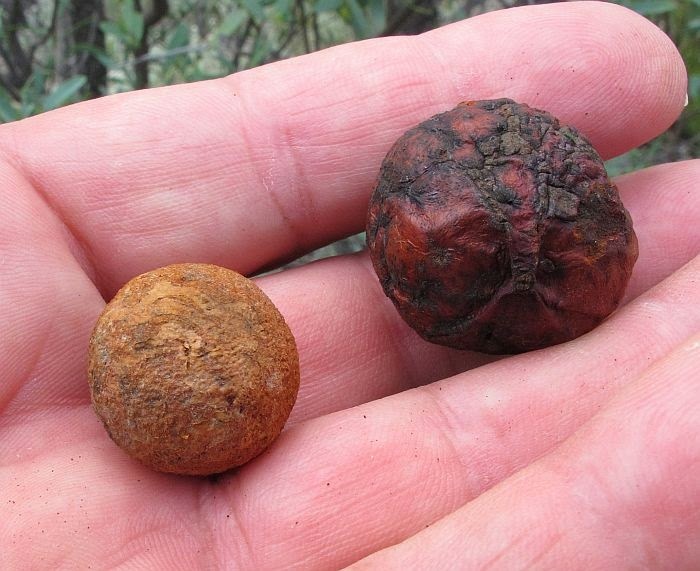 Although this species resembles Santalum acuminatum (the edible red quandong), it differs in several ways, the most notable being the endocarp or seed capsule, which is very smooth with no deep pitting, plus the paired leaves with obtuse tips. 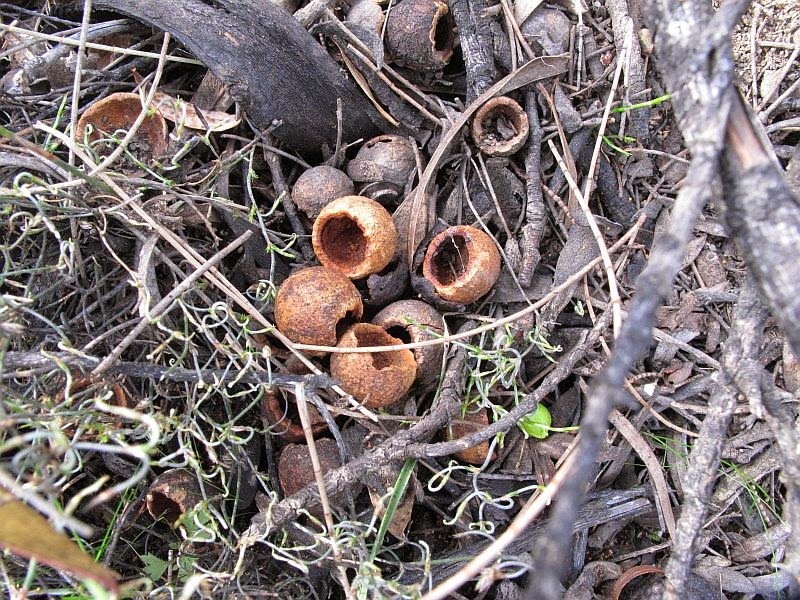 The ripe fruits are green to brown and not regarded as edible, although the emu finds them palatable and would the main distributor of the seed. 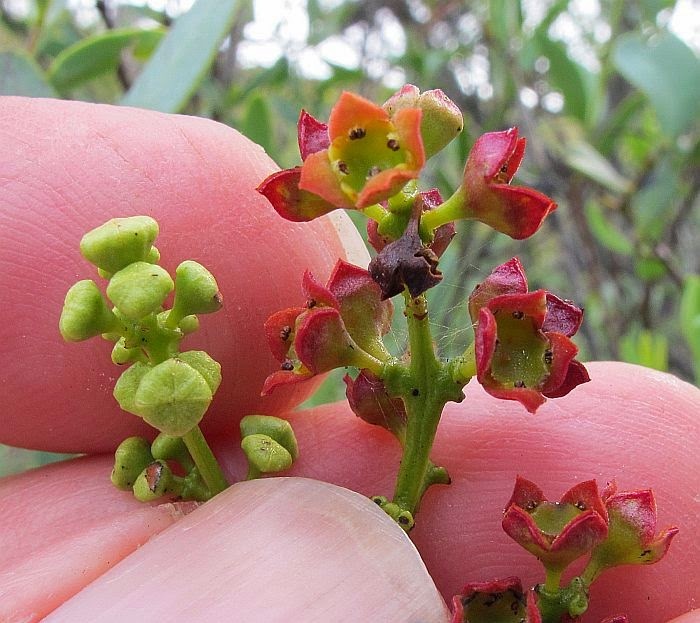 The flowers although small are quite colourful being red and orange when fully developed. They bloom from January to June, although with such a widespread species, the exact timing would be highly dependent on local climatic conditions. 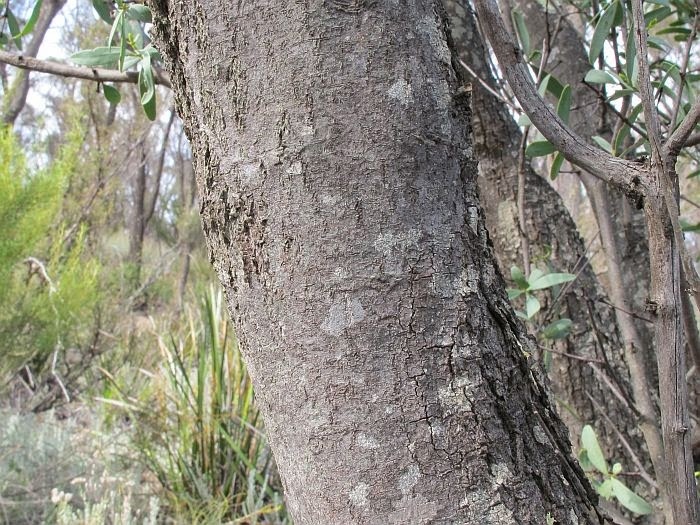 The Sandalwood like other members of the Santalum genus is a root parasite and taps into the root-system of other plants to exploit their water and nutrients, however few if any of these plants appear to be adversely affected. Santalum is part of the Santalaceae family, which contains many other root parasites including such notables as Exocarpus and Choretrum.